"We're in Camden," Donatella Versace said backstage after the Versus show. For the non-native speakers, Camden is London's original punky, funky hipsterville and home to a legendary and grungy market. Christopher Kane, Donatella's right-hand man at the Versace diffusion line, quickly added: "She's a rebellious, tough, angry, modern girl." In other words, the sweet, sporty attitude of Versus' Spring collection has been replaced by something darker—dirtier, even. 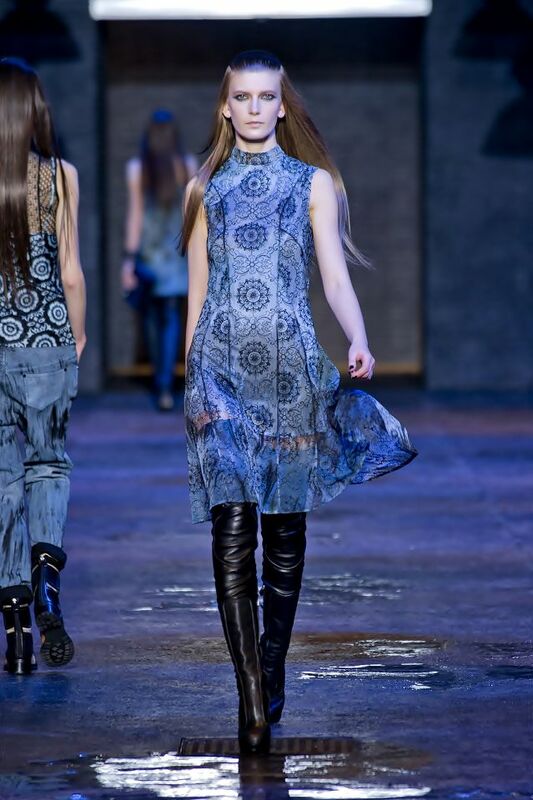 T-shirts were slashed to ribbons, dresses were held together with black leather lacing, medallion-print boots reached up to the mid-thigh hemlines of medallion-print minis, and jeans that almost slouched off models' hips were tie-dyed. More than any of Kane's collections for Versus so far, it captured the make-do looks of the council estate girls who were an adolescent fascination and continue to be an adult inspiration for him. Aspirational? Not quite. In fact, the collection rather celebrated the downbeat way things really are. But there was an offhand sexiness in that, which means that girls will continue to seek it out.